» Forum » All Pinball » $1250 Medieval Madness in Toronto Scam? » $1250 Medieval Madness in Toronto Scam? $1250 Medieval Madness in Toronto Scam? I just saw an ad for a Medieval Madness on sale in Toronto for $1250. I responded 8 minutes after it was posted assuming it was a typo (or scam but still couldn't resist). The ad had an online stock photo of MM and the writeup talked about how it was home use but in storage mostly. Said photos could be provided. Talked about moving and not having the space, how many stairs would be required to move it out of the current how. And generally well written (often scams have terrible grammar). The person responded quickly apologizing saying someone was already on their way. When I pressed them on the price, they said they had no idea it was so valuable but would not feel right renegotiating the price after agreeing to sell. The ad was pulled a few minutes later (which I found odd as if it were a scam, you'd think they would want to "catch" as many people as possible). Or phishing for email addresses. It was all done through an app that guards against sellers and buyers seeing each other's emails. So if it was only up for 10 minutes and he’s not able to get emails, doesn’t even push money transfers. What could he possibly gain/scam/benefit? Probably just enjoys trolling people making them think they just missed out. Laughing at them when they offer him more than asking price, etc... Nowadays, nobody sells something like that without spending a few minutes on Google to figure out a price. $1250 Canadian? Definitely a scam. 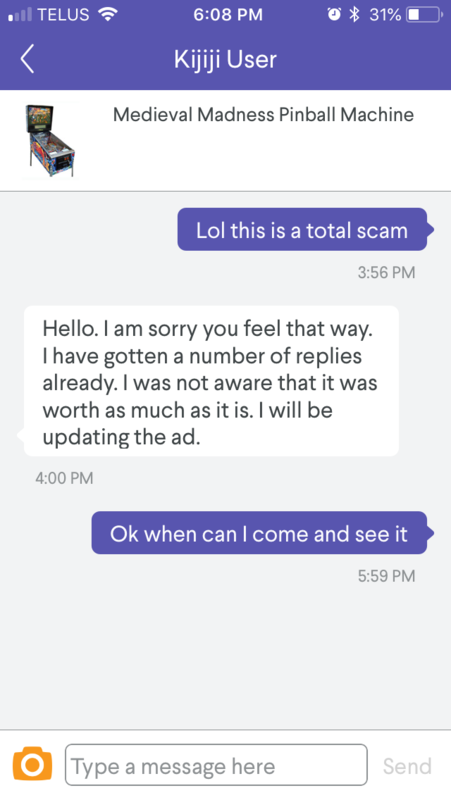 Nobody with the name Kijiji isn’t a scammer.